Every day there is a new trend emerging in the digital world to back up businesses and the society as a whole. Our world gets to see newer evolved solutions on a daily basis – models designed to work closely with the physical and the digital world. Technologies such as mobile, social media, predictive analytics, etc. have changed the course of our working style and made the world a slightly easier place to work in. We are creating solutions to deal with complexities and touch lives in a way that it results not only in digital difference but also as a source of increased value and revenue for the organizations. Applied Artificial Intelligence and machine-learning techniques are being used by organizations to boost up their work style and performance. They include many technologies and techniques; such as deep learning, neural networks and natural-language processing (NLP). Studies and applications of such techniques predict that AI will help us create applications like personal assistants, along with robots, drones, and autonomous vehicles. These applications will be able to understand, learn, adapt and predict on various complex scenarios, transforming our workplaces and homes. AI solutions will be able to intermingle with the surroundings and people more naturally to learn their behavior and understand their needs. AI and advanced machine learning can also help organizations in data analytics, provide insights, and can suggest possible actions to be taken. They will mimic human cognitive functions to create customized value for each customer using their continuous learning process. These applications will reduce costs, improve productivity and increase customer loyalty. Over the coming decade, it is expected that AI will be embedded into day-to-day things at the workplace and out for better results. Virtual Reality (VR) and Augmented Reality (AR) are coming out of their infancy and creating newer ways for individuals to interact with one another using various software systems. It is expected to evolve at a swifter pace and make itself known to various aspects of immersive consumer applications by the year 2021. Various apps have started to collaborate with VR and AR using mobile apps, wearable devices, etc. There are starting to form a digital network of immersive applications for an interactive and informative digital environment rather than just single-person experiences. AR is expected to drastically change customer experiences and enhance employee performances over a period few years. Digital twin refers to a dynamic virtual model of a process, product or service, which allows analysis of data analytics and monitoring of systems in a predictive fashion. This nature allows us to prevent downtime, develop new opportunities and plan better for the future using various simulative techniques. Digital twin has been made cost-effective to implement with the help of the Internet of Things (IoT). 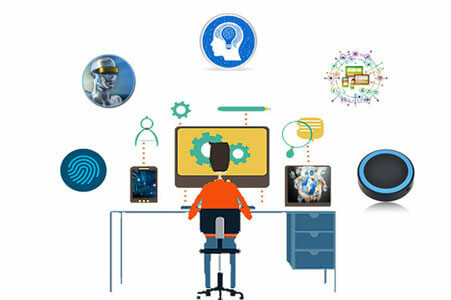 IoT has become highly imperative to businesses today with its ability to provide on-going insights on an organization’s products, operations, and customers. The whole is connected some way or the other. Hybrid Wireless Technologies are used to combine a mobile ad hoc network (MANET) with an infrastructure network. They allow us to leverage and translate between two or more different wireless providers, protocols, and radio bands. The whole idea is to connect one thing to the other to create applications that are capable of adapting, learning and meeting customer demands in every possible way. Adopt these technology trends while planning your upcoming budget, as they are expected to play a crucial role in the Java application development of business growth.